Research on stocks has improved significantly over the years; however I believe most of the time investors tend to ignore the most important document for research and that is the Annual Report of the company. Yes, Annual Report is the most important document but probably also the most ignored one. Basically, Annual Report of any company is the report card of the financial year gone by and when you read several such report cards, you get to know a lot about the business, the promoters, what they said, what they achieved and how they achieved. Since the last few years the companies (including the smaller ones) have started coming out with investor presentations; so while such presentations are extremely important in terms of understanding the business of the company, such presentations also tend to hide more than they reveal. Management Discussion and Analysis (MDA) – Most of the time MDAs are cut, copy and pasted from various sources and get repeated across various annual reports of the company; however a lot of times one gets to read the management’s view about the industry and the overall outlook for the company. One also gets to read about the steps the management might be taking to improve the overall functioning of the company. The MDA becomes especially important in smaller companies where the information is already scarcely available. Management’s statements when evaluated over several years help understand the thought process and probably the path ahead. R&D/Technology imported – Well this can be an important point depending on the type of company one is doing analysis on; like it helped me immensely in building conviction on Control Print in its early stages. Basically the company was transforming from being a distributor of coders and markers to in-house manufacturer and for that it had to continuously bring in new technology from outside India. 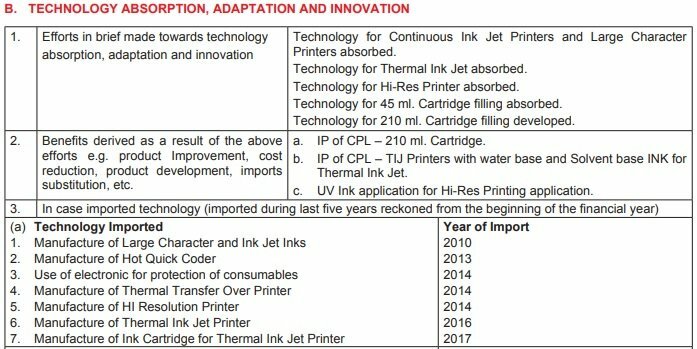 So, on reading the Annual Reports of the company it became quite clear that rather than just claiming the company was actually importing new technology each year and indigenizing the manufacturing of coders and related consumables. 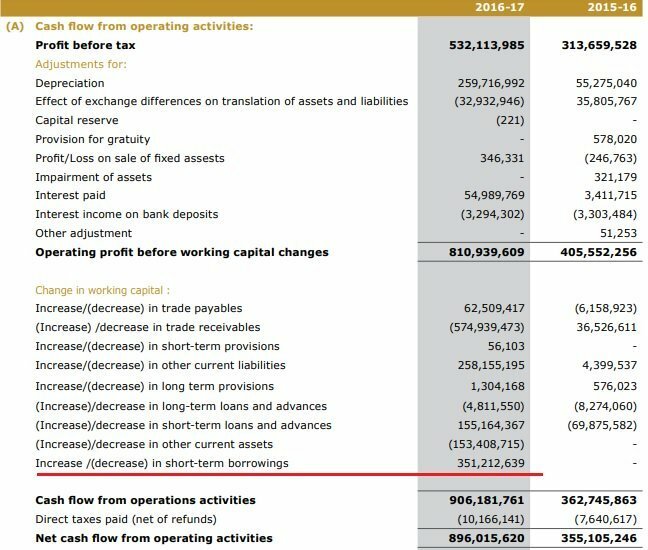 Schedules of Balance sheet, P&L and Cash flows – On various sites we tend to get the consolidated view of balance sheet items or the cash flows as reported by the company; however we don’t get to know what has actually gone into each balance sheet item or how the company has arrived at its cash flows. For example look at the above Cash flow statement of a company – It has added short term borrowings to cash flow from operations and the same inflates the operating cash flows. So while this may/may not be the accounting practice across the companies, a diligent investor will make his own adjustments to the numbers to arrive at more meaningful numbers. Management’s remuneration – This is again something one normally doesn’t get anywhere else other than Annual report. So the purpose of checking management’s remuneration is to see whether the management is taking home too much salary or not and whether the remuneration is aligned with their performance or not. Related Party transactions – Checking related party transactions is again important from the view of knowing whether the promoters are trying to short-change the minority shareholders by probably buying or selling too much from/to related parties (and probably leaving margins in those companies). Basically, it’s an important piece of information and becomes relevant in case of too many transactions. Shareholding changes – While changes in shareholding can be gauged from the quarterly filings on the exchanges, in the Annual reports one gets to see the top 10 shareholders of the company. This is especially important for investors who follow the practice of replicating the investment strategies of well-known individual and institutional investors who are known, or believed, to have exhibited good performance. Besides top 10 shareholders, one also gets to check the changes in shareholding of promoters and other executive and independent directors. Following shareholding of promoters/directors is especially important from the purpose of understanding if they have the skin in the game or not. Off-balance sheet items – Last, but not the least, there are certain important off-balance sheet items like contingent liabilities, tax disputes, other claims, etc. What I have normally observed is that books of those companies tend to be clean where the tax disputes or other claims are lower. While no single point can make or break the investment thesis, it does help to know how the company you are invested in is faring on all the above points. Also, all the above points add immensely to the qualitative analysis of the company. Disclosure: I hold Control Print in personal account and have recommended it to clients. Currently, we have a neutral rating on the stock. For a more detailed disclosure, please read below.